Floristic wedding design: where to start? Wedding is the most exciting event in the life of every person. But before the bride and groom there is a huge work on the organization of the wedding, you need to think it over to the smallest detail and forget nothing! After all, the wedding day should turn into a real fairy tale. And what can be a fairy tale without flowers? 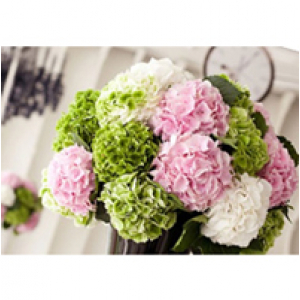 A very important detail of each wedding is its correct floristic design. But where do I start? Initially, the bride and groom should determine the style and theme of the wedding. After all, floral design should emphasize the chosen style, harmoniously complement it and become its integral part. It is very important, with the help of properly selected colors, to emphasize the individuality of the groom and the bride, to convey the timidity and touchingness of the event. What does wedding floristics include? • A bouquet of the bride, which is the most important detail of the image of the bride. • Boutonniere groom, which is executed in the same style as the bridal bouquet, in order to create a harmonious overall picture. • Bracelets for bridesmaids. At will, you can also order bracelets for bridesmaids who will repeat the floral composition of the bouquet of the bride. It will be more effective and more interesting to look at such bracelets if the bridesmaids wear dresses in one color range. • Wedding arch. Usually, the wedding arch is used only at outing ceremonies. • The so-called "back-background" of the bride and groom in the banquet hall should also be festively decorated and decorated with flowers. • Registration of the banquet hall, where the celebration will take place. Usually, the decoration of the tables is included in the decoration of the hall, which will really become a pleasant detail for your guests. • Decoration of cars. Satin ribbons, many multicolored balloons gradually move aside. Live flowers, as a wedding car decoration look much better, more festive and spectacular. In order to decorate the banquet hall you need, first of all, to know what exactly you want. Now it has become very popular to hold weddings in a certain topic. The chosen theme should be in everything, can be traced even in details. On this, discuss with the florist beforehand what exactly will be the wedding in your presentation, so that the flowers do not get out of the general picture, but become a harmonious addition. It is also worth considering the preferences of the groom and the bride in choosing the right colors. Decoration of the banquet hall must be performed in the same style as the wedding bouquet. The main rule of wedding design is to create a general picture of a harmonious one. It is important that all wedding design was as one. In that case, your wedding will be fabulous and surprisingly stylish. After all, floral design is necessary not only to add festivity and elegance to the celebration, but also to create exactly the atmosphere that should be present at such an exciting event as a wedding. Also, experienced florists know which flowers to use to create this or that effect. For example, if you want to turn a wedding into an incredibly tender and airy holiday, then the floristic decoration of the banquet hall uses eustoms of pastel tones, peonies. It is these flowers that will help create an incredible splendor and add to the triumph of tenderness and trepidation. The main thing is to entrust the efforts for the flower decoration of your wedding to real professionals, then it will become an amazingly beautiful and truly most beautiful event in your life.